Chipotle Grill Under Scrutiny by ICE: Now Who’s Going to Roll my Burritos? I don’t know you but I fear for the “integrity” of my meal. 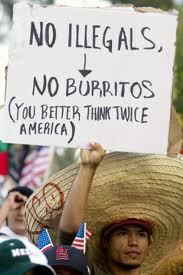 If not a Mexican, who is going to be rolling my burritos from now on? a Puerto Rican? a Texan? No, señor! This entry was posted in Food, Immigration and tagged Chipotle, Immigration. Bookmark the permalink.